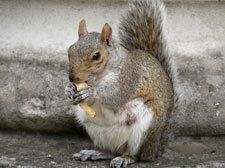 Grey Squirrels are grey fur on the top and lighter grey on the bottom. Its 17 to 19” long and weights 15 to 24 oz’s. They mate twice a year and have 3 to 5 young. They are active during the day. Grays are very territorial and will chase away any squirrel that is not part of their family.